This is the second of three posts dedicated to The Made in 1938 Blogathon being held over at In The Good Old Days of Hollywood and Pop Culture Reverie. Brief Synopsis – Three friends try to keep their friendship alive after they all fall in love with the same women in the failing German economy following World War I. My Take on it – This is a film that seemed to have an interesting premise and therefore I chose to see what it was all about for this very unique Blogathon theme. Margaret Sullavan was nominated for an Oscar for her role here as leading actress. Unfortunately, the story itself is quite boring and doesn’t manage to find a way to be interesting or even somewhat plausible which takes so much away from it all. They don’t manage to develop the characters enough and that makes it quite hard to care about any of them or about anything they seem to do. The fact that this film came out during the height of German Fascism makes it even harder to sympathize with because of everything going on around them. The rest of the cast is fine, but none of them are able to stand out among them all which makes it even more difficult to enjoy this kind of story. Bottom Line – Very strange film that just doesn’t work very well at all. The characters aren’t developed well enough and it’s quite hard to care about any of them or what they do The fact that this film came out at the height of the beginning of Fascism also makes it even harder to sympathize with the characters due to everything going on around them. The cast is okay yet none of them really manage to stand out among the rest. Too much of the plot drags along and doesn’t manage to stay interesting at all. I saw this film a long time ago. 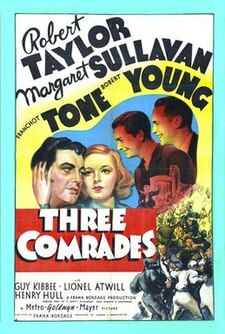 If I remember correctly, a lot of the film’s appeal depended on the viewer finding Margaret Sullavan fascinating. She was never one of my favorite actresses, so I, too, found the film dragged (if I remember correctly). However, I really enjoyed Tone’s performance in the film.